Anchor’s been gaining a fair bit of steam lately with its dead simple mobile podcast editing app. The New York startup has also been branching out in some interesting ways, including the recent launch of a Manhattan-based studio designed to give podcasters access to far better equipment than the usual Skype setup. Today, it’s taking on another key issue with upstart podcasts: monetization. 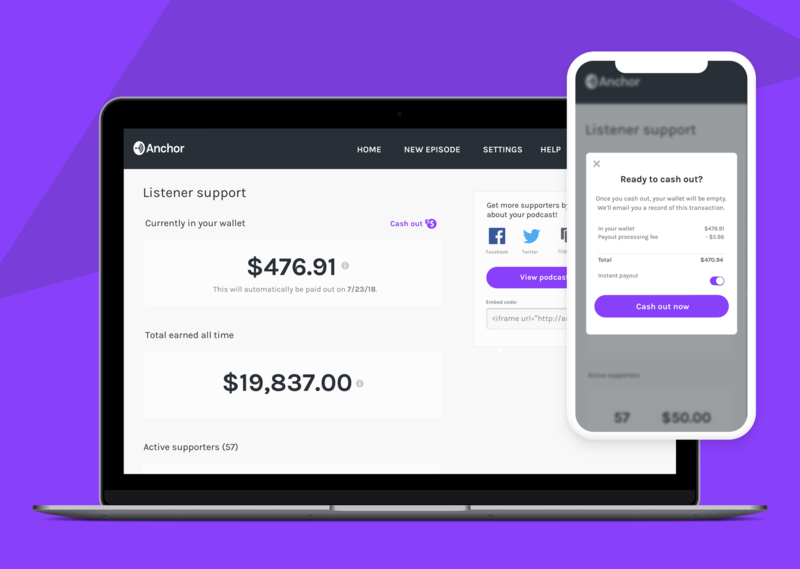 Anchor is launching Listener Support, a Patreon-style subscription service (with a very NPR name) that lets podcasters make a little money for their hard work. Once enabled on an Anchor dashboard, hosts are encouraged to share a link in their show notes, where listeners can plunk down $0.99, $4.99 or $9.99 a month for the privilege of audio content. After the money starts flowing in, hosts can collect their earnings by hitting the Cash out now button. Anchor’s taking a 4.5 percent servicing fee from the subscriptions, on top of Stripe’s standard 5 percent processing charge. iOS and Mac users can also subscribe via Apple Pay. At launch, the service is available for a handful of partner podcasts, including ​Good Hustle​, ​Over the Thread​, ​Sweet Husbands​, ​So Fashionating​ and That’s Weird​. The move follows the launch of a similar blockchain-based service from top Android podcast app, Castbox.